Scorpion season will soon be here before you know it, and preparing for this time of year properly is super essential for your benefit. A scorpion sting can be quite painful, and in some cases, it may even be life threatening for many. Risking scorpion invasion is most likely not a good strategy for you and your loved ones. The best way to prevent scorpions from entering inside of your home is to contact a professional exterminator with tons of experience in scorpion control in Scottsdale, Arizona. You can start preparing for scorpion season by taking action around your home. Try to keep your home as clean as possible, especially in the areas where you eat, prepare, and store food (your kitchen). Scorpions may be attracted to an open garbage can or crumbs scattered on a counter or the floor. They might also come into your abode looking for some water, so try to keep all surfaces as dry as possible. Get any plumbing leaks repaired fast, and store any garden hoses away from the direct perimeter of your dwelling. Scorpion sealing in Scottsdale Arizona is generally a job for a trained professional exterminator. The first thing that a professional might do is to seal all of the possible entryways into your home. This may include sealing underneath and around the door frames of your residence. A knowledgeable professional can also provide you tips on weather-stripping doors and threshold areas to keep scorpions away from entering your home. Another way to repel scorpions is to have your home dusted with repellent as much as needed. Unless you have been trained to do this, you might consider hiring someone who knows exactly how to deter these dangerous creatures. Areas that should be dusted include the attic, the foundation of your home, and any electrical outlets throughout your home. An expert will be able to find all of the cracks in your home where scorpions may go to hide. These potential hiding places should be dusted often, so scorpions are not tempted to reside in them. 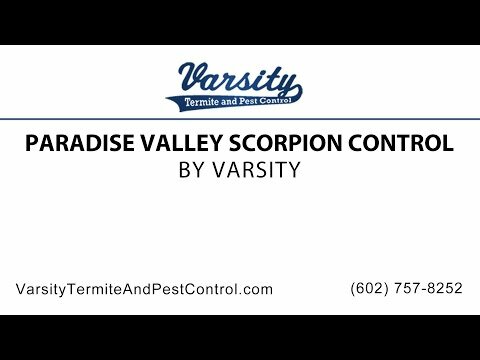 Instead of allowing your abode to be infested with scorpions, contact Varsity Termite and Pest Control. You will talk to a professional who is knowledgeable about scorpion control in Scottsdale 85252. The professional experts at Varsity Termite and Pest Control will leave no potential entryway or hiding place unprotected throughout your home. You can expect a thorough sealing and dusting job from your Varsity scorpion exterminators, so you can rest with both eyes closed with ease at night. If you have any more questions and concerns for us or want to know more information about scorpions, please contact us today! We look forward to hearing from you and helping you with your needs!